Going blindly through life isn’t the best way for one to reach their goals and aspirations. 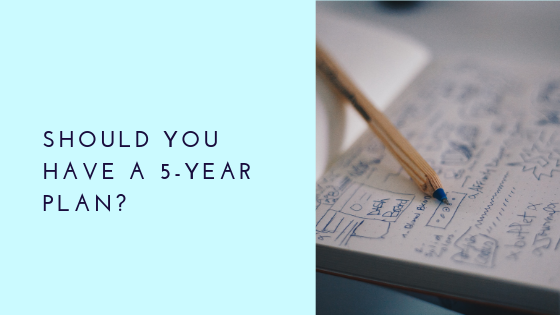 However, do five-year plans really help? How can one ever know they will be where they hope to five years from now? The truth is that no one really knows the future. As much as someone may try to plan for the right things to happen, nothing will ever go exactly as planned. One can map out their life as much as possible in the hopes that they will achieve everything that they’ve been working towards, but it is essential to leave room for flexibility as part of these plans. Career counselor John D. Krumboltz shares in the Happenstance Learning Theory that one needs to expect unplanned events as inevitable and a necessary part of every person’s career. Even with the best-laid plans, true success comes from aligning what one hopes to happen with what is already occurring in that person’s life. While many people hope that putting together a five-year plan will be an easy fix to get their life together, this is hardly the case. Krumboltz goes on to share that the role of any career counselor is to help their clients understand how to achieve satisfying lives in their career and personal lives as well. Krumboltz purposefully leaves out creating any kind of specified plan, as it is impossible to stick to one with all the expectations people put on themselves and their lives. Instead, Krumboltz makes it a point to encourage clients to make the most of any opportunity when they happen. As much as life can be about planning one’s dreams and goals, truly becoming successful is about taking action and making one’s own luck. The reason so many people cling to the idea of a five-year plan is out of comfort. Having any plan in place is akin to having a safety net. Instead of wandering aimlessly through life, a plan acts as a guide of sorts. However, no one knows what lies ahead in the future. This is why all planners and hesitaters must eventually become do-ers if they hope to achieve the life they dream of. “Ditch the dream and be a doer, not a dreamer…You don’t have to know. You just have to keep moving forward”.